Monica joined the Johns Hopkins Bloomberg School of Public Health in 2016 as an Assistant Professor in the Department of Molecular Microbiology and Immunology. She completed her PhD at Rockefeller University in Nina Papavasiliou's lab, where she developed VSG-seq, an approach for measuring VSG expression in T. brucei populations in vivo. When she's not in the lab, she likes to hang out with her animals, Bailey and The Stallion. 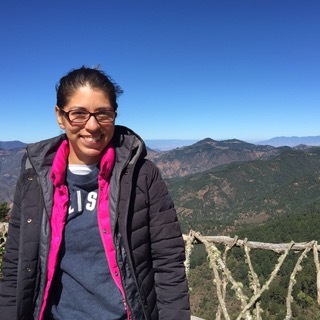 Gabriela received her PhD in Molecular Biomedicine at CINVESTAV in Mexico City in 2016. She has been working with trypanosomatids for many years, and during her PhD she discovered the first negative regulator of transcription in T. brucei. In the Mugnier Lab, she is studying the mechanisms of mosaic formation in T. brucei. Outside the lab she enjoys running, doing yoga, playing with her dogs, and baking (a pastime she finds very similar to labwork!). Bailin (Lucy) graduated from the University of Washington with a BS in Molecular, Cellular and Developmental Biology, with a minor in Microbiology. Before coming to Hopkins, she was working to develop a dual-color bioluminescence technique to observe the Giardia life cycle. She hopes to go to medical school and to adopt a cute greyhound in the future. In her free time, she loves traveling, seeing her friends and challenging bizarre foods. Alex is a first year Pathobiology PhD student. He received his B.S. in Biochemistry from Clemson University in 2016. Alex was a lab technician working on glycosomes in Trypanosomes before becoming a graduate student at Johns Hopkins. When not in lab or studying, he enjoys playing soccer and volleyball, backpacking, and trying out Baltimore’s local food and beer. Jaclyn is a fourth year PhD candidate in the Biochemistry, Cellular, and Molecular Biology program. Jaclyn received B.S. degrees in Biochemistry, Human Biology, and Polymer & Color Chemistry from North Carolina State University in 2015. When Jaclyn isn’t in lab, she can be found at the BARCS, the Baltimore City animal shelter, walking dogs, or watching/reliving NC State basketball or Carolina Panthers football games. Jaime is a first year ScM student in MMI. She graduated with Bachelor’s of Science in microbiology from UC Santa Barbara where she did research on bacterial toxin and communication systems in E. coli. In her free time, she enjoys hiking, drawing, and being bad at video games. Sean is a junior at Johns Hopkins University majoring in molecular and cellular biology. He aspires to attend medical school and to specialize in pathology, and he feels that the lab will provide him the foundational skills necessary to fulfill his ambitions. In his free time, he enjoys hiking, playing basketball or tennis, and watching sports. Shane is a junior at Johns Hopkins University majoring in Molecular and Cellular Biology with a minor in Computer Integrated Surgery from San Francisco. He hopes to attend medical school and specialize in emergency medicine or infectious diseases. In his free time he enjoys playing soccer and basketball, kayaking and fishing.